I was feeling the love recently when I was invited to four separate Porsche garage launches for the 718. I decided to go to our local Porsche garage at the Silverlink and it was really great to see some of the old team – yes I’m talking about you Sid! I’ve always had a soft spot for the Boxster as it was my introduction to the Porsche family. I remember the deal as if it was yesterday from start to finish. I bought a copy of Top Marques and saw this Boxster for sale in Edinburgh. A week later I was picking it up. When I started the car up for the ﬁrst time the noise made the hairs on the back of my neck stand up. The engine is behind you and with the noise from the exhaust, it made for a truly memorable drive home especially with its exemplary handling. After seeing the 718 being launched I really couldn’t wait to get my hands on the keys and take it for a drive. A trip to York was on the cards and the weather was great so I had the perfect car for the day. As I’m lucky enough to get to drive different cars most weeks, it’s interesting when I get some feedback from people. I think the colour of the car and its red roof just made it look really amazing indeed. Normally no one even comments on the car, but the 718 was getting a few enviable looks, with people commenting on just how beautiful the car looked. 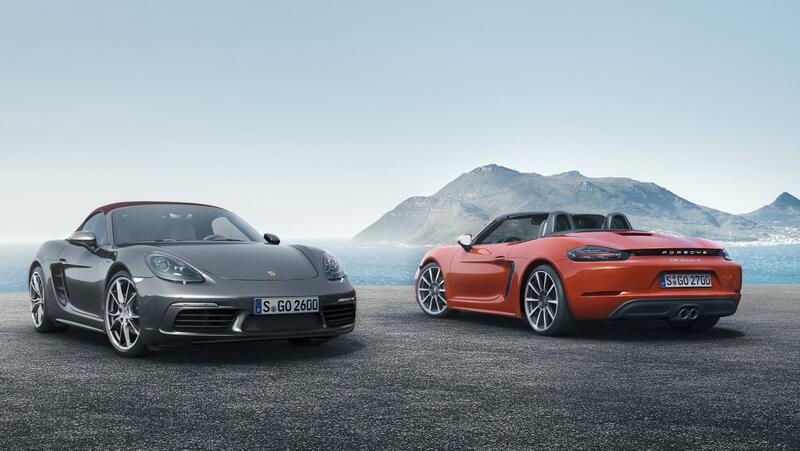 The Boxster has always been the benchmark for two seater sports cars so the 718 has a great deal to live up to. 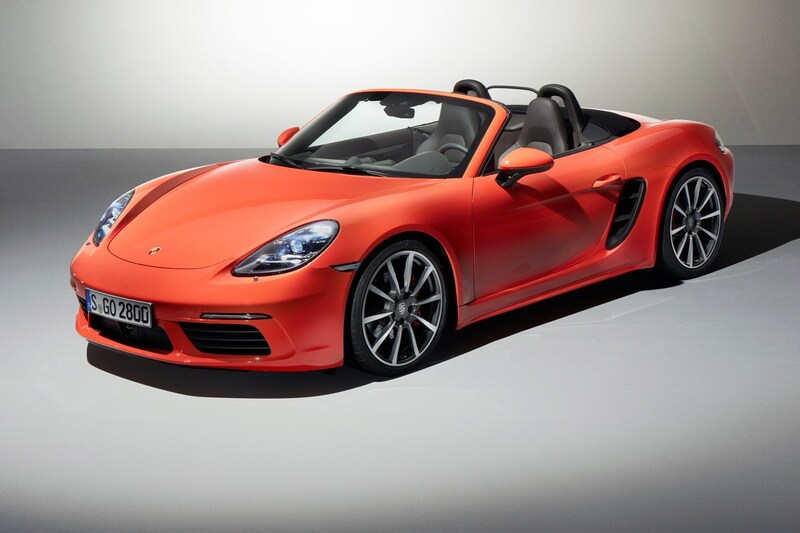 It has two engine choices like the previous Boxster. The difference now is that both engines are not only smaller but are both turbocharged. You can choose from either a 2.0lt engine or a 2.5lt engine getting to 62mph in 5.1 and 4.6 seconds and top speeds of 170mph and 177mph respectively. In the right hands the car should return around 35mpg and not surprisingly, whilst I had the car I managed to average around 20mpg! As I’ve said, the engine is mounted behind the driver so not only does that help give the car perfect weight distribution it also gives you two boots – one behind the engine and one at the front. As the engine powers the rear wheels all the front wheels have to do is the steering. The feedback from the handling is brilliant and I for one am a fan of the electric steering. Unlike some I’ve tried recently, Porsche has nailed it with excellent feedback through the wheel. The cars subtle design tweaks really look great but inside the car looks just like the 911 with the dash and multimedia system lightyears ahead of the previous model. The system comes with Apple Play so it’s much easier to link your iPhone and to access music and media via the touchscreen display. The optional Porsche adaptive suspension lets you choose from normal or sport mode. This is more at home on a race track as you feel every imperfection in the road and we all know how bad our roads are here! Owners will really relish driving this car down some country roads as it really feels planted to the road and there is virtually no body roll at all. Put the car into sport mode using the new dial on the GT steering wheel and the engine really comes to life. From the popping and rasping noises from the exhaust, you really want to downshift all the time just to hear the symphonies from the engine. The 718’s roof can be opened and closed on the move, despite being a cloth roof the wind and road noise isn’t that bad at all, you can quite easily hold a conversation while driving on the motorway. The rear visibility isn’t excellent though and I found myself needing to use the rear parking sensors all of the time. As with all Porsche cars it’s very easy to go mad with the spec sheet. The car comes with air conditioning as standard, part leather upholstery, digital radio, parking sensors and heated seats. For me the car needs large alloy wheels and the excellent PDK gearbox. They are priced from £42,000 for the base 718 with the S coming in at £51,000 – but believe me when I say they can become really expensive once you start ticking the options on the spec sheet. If you are looking for a well-engineered two seater convertible the 718 is still the best car by miles and you can’t help smiling after every drive.